BROWNSVILLE, TX -- Close to the southern tip of Texas a border wall suddenly ends. Its final post sits in a dry cornfield half a mile from the nearest bend in the Rio Grande river, the actual border with Mexico. It would be easy to walk around it. Tires left by the border patrol rest nearby. Agents drag them behind trucks to smooth the cracked earth and check for footprints. Unlike other famous barriers in history such as the Berlin Wall or the Great Wall of China, the U.S. version is not much of a wall. What stands in Texas is fragmented series of fencing, composed of enormous steel bars embedded in concrete close together. The rust-colored thick bars that must reach a height of 18 feet loom over the landscape, forming teeth-like slats that split farmland, slice through backyards, and sever parks and nature preserves. There are miles of gaps between segments and openings in the fence itself. As a result of the Secure Fence Act passed in 2006, the government built some 650 miles of wall along the 1,954-mile U.S.-Mexico boundary. While 1,254 miles of that border is in Texas, the state has only some 100 miles of wall. Republican presidential candidates insist they'll finish it. But completing the Texas part of the wall would be a daunting task thanks to the border's sheer length, the fact that it sits in the center of the snaking Rio Grande, and because treaties with Mexico prevent either country from constructing within the river's flood plains. And unlike in other southwestern states, most border land in Texas is privately owned. Finishing the some 1,300 miles of border fencing would also be costly. According to a 2009 Government accountability report, pedestrian fencing, meant to keep out smugglers and migrants crossing on foot, has run anywhere from $400,000 to $15.1 million per mile, averaging $3.9 million. More recent construction has been even more expensive, with segments constructed in 2008 costing $6.5 million per mile. If kept at this rate, the wall would cost nearly $10 billion to complete just for materials, and challenging geography could bring it much higher. "With every twist and turn of the Rio Grande and every steep terrain in Arizona, it would cost easily that much," said Adam Isacson, a border expert for the Washington Office on Latin America. 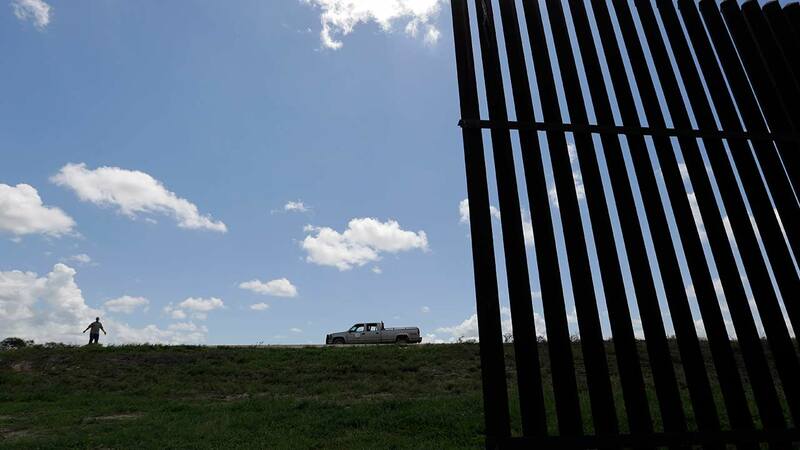 Officials overseeing the wall's construction faced a legal and logistical nightmare from the start, according to emails obtained under the Freedom of Information Act and litigation by Denise Gilman, a law professor at the University of Texas. The hundreds of emails, which Gilman shared with The Associated Press, show that from the planning phase some 65 miles of the proposed route sat a half mile to a mile from the border, making it not a true border wall. Officials struggled to find places where construction could start fast to meet Congress' deadline of building 255 miles by December 2008. They sought contingency fencing that did not require "significant real estate acquisitions" or cut through sensitive wilderness, the emails show. Wealthy landowners demanded more compensation or refused to allow construction. Hundreds of property owners were sued just to build the existing chunks of wall. Some 400 relinquished properties ranging in size from a driveway to commercial lots and farms, costing the government at least $15 million, according to an AP review of land cases in 2012. Among them was Eloisa Tamez, who refused to cede her three acres in San Benito, land that had been in her family for generations. A federal judge ruled in the government's favor, and Tamez was compensated $56,000, with which she funded a scholarship at the University of Texas Rio Grande Valley where she works as a professor. "It might be just a little piece of land," she said. "But to me it meant my life." The Rio Grande Valley is home to 54 miles of wall, and the official name of the border barrier there is Pedestrian Fence 255. The area is the major crossing point for tens of thousands of families and unaccompanied children, many fleeing gang violence in Guatemala, El Salvador and Honduras. The surge that began last year resumed in recent months, and Gov. Greg Abbott extended the Texas National Guard border patrol deployment in response to more than 10,000 unaccompanied children crossing into the U.S. in October and November. Some residents have found themselves cut off by the wall. Pamela Taylor, who lives near Brownsville, originally fought the wall's construction. Now her Texas home sits behind the wall on the side facing Mexico. She still leaves coolers of water for thirsty migrants, though she wishes more of them would come to the United States legally, the way she emigrated from England. The wall "doesn't do any good. It's a waste of money," she said. But she's gotten used to it. Some locals say it's better than nothing. Othal E. Brand Jr., the president of the Hidalgo County Water District 3, which supplies water to the McAllen area, pointed out where the fence separated a 20-acre reservoir from two pumping stations, which sit behind it along a bend in the Rio Grande. Brand said this land, adjacent to a wilderness reserve, was for years overrun by nighttime crossers and that smugglers threatened and even shot at his employees. "The wall is only part of the solution," he said, "but it's an important part." Several candidates for the presidency in 2016 have proposed building more border wall along the nearly 2,000 mile frontier with Mexico to keep people from crossing into the U.S. illegally. Here is what they have to say about a border wall. Trump has been the most outspoken about building a wall, and insists he'll make Mexico pay for it. "We're going to do a wall. We're going to create a border," he said during the third Republican debate in October. Trump also made reference to the Great Wall of China, and claimed that "Mexico is going to pay for the wall." On his website, Trump reiterates his assertion that "there must be a wall across our southern border." In November, after eight Syrian Christians sought asylum and turned themselves in to officials in Laredo, Texas, Trump tweeted, "WE NEED A BIG & BEAUTIFUL WALL". The Texas senator pledges on his website to "build a wall that works," and to "complete the wall," though he offers no specifics as to how he would do so. The Florida senator says the most vulnerable sectors of the southwest border must be secured, according to his website. During the Republican debate in September, in response to a question, he said that "we must secure our border, the physical border, with a wall, absolutely." In contrast to his rivals, Bush has said he considers a massive border fence to be unnecessary. "We don't need to build a wall," he told a group of Latino business owners in September. A month before in McAllen, Texas, across the river from Reynosa, Mexico, the former governor of Florida told supporters that Trump's wall strategy "not based in reality." At a November town hall campaign event in New Hampshire, where she was asked about securing the U.S.-Mexico border, the former New York senator and secretary of state stressed that she'd voted for the 2006 legislation that authorized the building of some 650 miles of wall. "I voted numerous times when I was a senator to spend money to build a barrier to try to prevent illegal immigrants from coming in," Clinton said, "and I do think that you have to control your borders." She later apologized for using the term "illegal immigrants." She has not said whether she would extend the wall. The independent senator from Vermont sees the importance of securing the border, but is opposed to building a fence to do so, according to his website. "I also opposed tying immigration reform to the building of a border fence," he said during a speech in June to the National Association of Latino Elected and Appointed Officials.